A new series of London walking trails have been launched along South East London’s Green Chain – a 40-mile network of footpaths running through parkland and woodland. 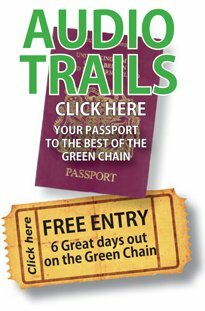 Parmjit, a Green Chain Walks Leader, and Gerald, a local expert, are ready to take you on three fascinating walks to explore some of the greener parts of South East London. Parmjit and Gerald are fictional characters devised solely for this project to create the feel of a real guided walk. The audio trails were devised with help from a number of local community groups whose expertise and passion inspired the flavour of the scripts. We were also commissioned to produce downloadable PDF watercolour maps to help guide visitors along each route. For further London walking trails why not download the Darwin and the Dinosaurs audio trail and the Morden Hall Park audio trails app.